January 2016 – Reform in 5 Minutes! What does it mean to be a “great doctor,” to get the “best” results? It means that the quality of your work is superior to some benchmark. If you ask a provider for a “quality” metric, he/she will give you something objective such as observed/expected mortality. But payers see it differently. I will attempt to get you to see “quality” differently, through the eyes of a payer (NB. The federal government is one and it is the biggest). “Quality” in healthcare is defined as getting the right care to the right patient at the right time – consistently. Let’s look at a quality metric that we are judged on: DVT prophylaxis for surgical patients. The right agent must be given at the right time after surgery for most patients not having out-patient surgery. The consistency has become so high that missing it in a few patients per thousand drops you out of the top tier. To circumvent a penalty, you must accurately document why you didn’t follow the standard. Now try to apply that to all of medicine, and you get the “quality” rating in the slide below. Next, consider cost, and think across the continuum of a care episode, including long-term outcomes. 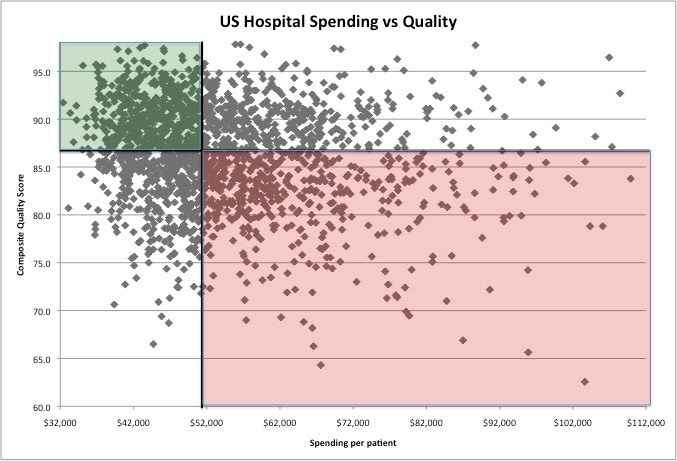 Usually, complications are what contribute most to costs, as well as new technologies with unproven long-term outcomes. Therefore, consistently applied best practices and best efforts to prevent complications are what keep costs down. Now look at the 4-quadrant graph below. Each dot represents a different hospital in the U.S. The variance is huge! We may not agree with the definition of quality, but it is here to stay. We may not agree with payment methodology based on value (remember the definition? ), but it is here to stay. Rewards await healthcare networks that fall into the upper left quadrant. That’s where we need to be to thrive and that’s what we need to accomplish …. together, hospitals and clinicians.